Your Amazon 1099-K is an accounting of all money received by Amazon from your buyers and is just a summary of the dollars Amazon received for you as a payment processor (the same as what a bank would send you if you had your own merchant account for processing credit card payments). It is not adjusted in any way for fees paid, shipping purchased through Amazon, sales tax collected, reimbursements made to you by Amazon or any refunds issued. The best way to understand your 1099-K numbers is to run a Date Range Report in Amazon Seller Central. *If you add up all the items highlighted in yellow you should get your Amazon 1099-K total for the year. *You'll notice Promotional Rebates and Marketplace Facilitator Tax are negative numbers so subtract them from the total. Reminder: Promotional Rebates are credits given to buyers before they pay like free shipping on orders over $35 - the buyer is charged for shipping then credited back the shipping amount all within the one transaction so the shipping charge is included in your income but also taken out through a promotional rebate at the time of purchase. 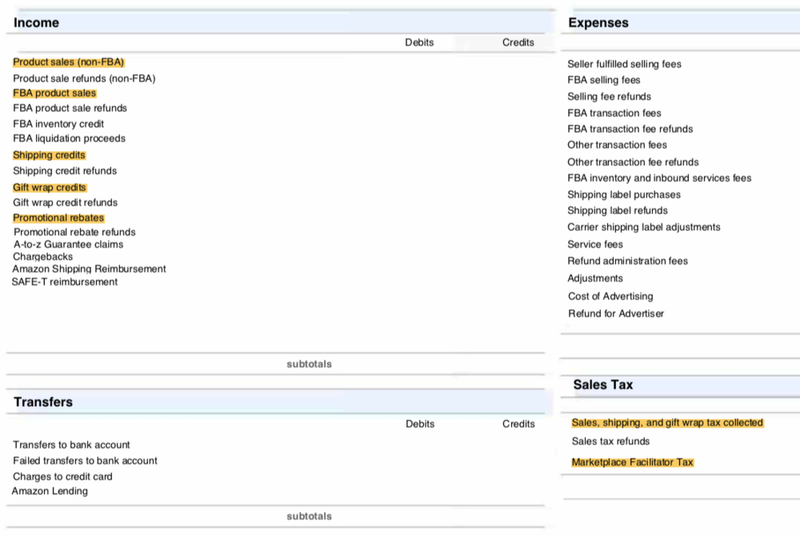 *FBA reimbursements for lost and damaged inventory in your 1099-K - you need to add this as additional income on your tax return separately from your 1099-K number. *You will also have to adjust your return for sales tax collected which is included in your 1099-K number. Trying to understand your Amazon 1099-K? Enter your information below and get our FREE guide Amazon 1099-K Explained!